If you’ve ever fantasized about owning your own private Italian island, and if you have extra pocket money to spend, this may be the opportunity for you. 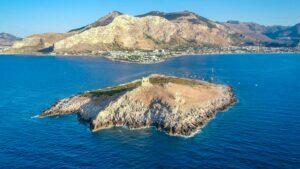 Isola delle Femmine, a small island off Sicily’s northern coast near Palermo, could be yours for as little as €1 million. An aristocratic family, which has owned the island since the 1600s, is selling it because they can no longer keep up with its maintenance. The small island is just 300 meters off the coast of a Sicilian town of the same name. Its only structure is the ruins of a 17th-century stone tower. As the whole island is part of a protected marine park, it contains ancient Greek and Roman ruins, ancient Roman shipwrecks buried in the sea, and an abundance of flora and fauna, including birds, marine life, and 120 species of plants. Pilo Bacci grew up vacationing on the island, swimming, snorkeling, diving, and enjoying the solitude, like her family had done for centuries. As the island is privately owned, there are no public ferries running between it and Sicily. The island’s terrain is built for both exploring and relaxing: it is wide open and grassy, with pebbly beaches as well as a sandy beach for sunbathing and landing small boats. Though its name means “island of women” in Italian, it is uninhabited today. The name comes from a legend that 13 Turkish women were stranded on the island after their ship wrecked. Throughout the centuries, Isola delle Femmine has served several purposes: It was a military outpost for both Italians in the Middle Ages and Americans during World War II, a cattle grazing field, and a residence for ancient Greeks and Romans. Good negotiating skills will be essential to anyone who wants to purchase the island. “The price at first was 3.5 million€ but given nobody showed up we’ve now lowered it to a flexible range between 1 and 3 million €, open to offers and negotiations. Anywhere close to 2€ million we’d be very interested,” said Romolini.